It’s fair to say that pro-government forces during the latter part of the 18th century proved better than the anti-government ones at manipulating public opinion against the radicals who demanded political and social reform. Governments of the day worked hard to disrupt or block messages they found seditious, while making sure their own suffered no such disruption. Radical meetings were broken up and leaders either driven into exile or arrested. This was especially true during the period of war against the French Revolutionaries and Napoleon. What had happened there, could happen in Britain. England’s own ‘Glorious Revolution’ had been a hundred years before and the ruling elite (save only those, like King George III, most interested in restoring absolute monarchy) tended to see it as having closed the door on reform for the foreseeable future. Now the revolution in France had demonstrated the power of popular agitation to overthrow a long-standing monarchy and destroy both an aristocracy and an established church. This called for firm action by those in favour of the status quo. Habeas Corpus was suspended in 1794 , allowing the government freedom to hold suspected traitors without bringing them to trial. The power of Parliament was used to pass draconian legislation banning radical meetings. Deprived of the means to produce and distribute a co-ordinated message, organisations peacefully promoting political reform, like the London Corresponding Society, were driven out of existence or underground. Thomas Hardy, one of its founders, John Horne Tooke, John Thelwall and others were arrested and charged with a new kind of treason: what government propaganda called “modern” or “French” treason. Previously, high treason was based on replacing one king with another. The republican radicals wanted to overthrow the entire monarchical system. Though the government tried its best, all were later acquitted. Napoleon became the conservatives’ best weapon for a time. Pro-government conservatives were able to tar the radicals with being tools of a petty French tyrant. British xenophobia was, as now, a powerful ally to those seeking to maintain the status quo. For many decades, radicalism had been neatly equated with atheism, disloyalty and lack of patriotism. But when the French Revolution broke out, the conservatives were quick to suggest the radicals and reformers were planning to hand Britain over to the ideas of foreigners. Bluff John Bull became the champion of solid and sensible Britishness against effete, theoretical continental notions. Religious and sectarian conflicts lay at the heart of political divisions throughout the 18th century. Conservative factions were committed to the necessity of an established church and its various privileges. Radicals were either sceptical of the importance an established church, committed to freedom of religious conscience or anti-religious in a general sense. Hence the conservatives tried to brand them all as atheists, even if they were merely Dissenters. Satirical cartoons were also circulated widely. Many print-sellers stuck their newest stock on the windows of their shops to attract a crowd. Even if you couldn’t afford to pay for a copy of the cartoon, you and your fellows could stand outside and laugh at what—or more likely who—it portrayed. Here though the conservatives did not have it all their own way. In an age without censorship or effective laws on defamation, everyone was fair game. Radicals and revolutionaries were mercilessly lampooned, but so were the king, the nobility, government ministers and just about everyone else in public life. In the hands of anyone wanted to spread a message, comic and satirical prints were effective weapons. They could damage the intended victims by exposing them to ridicule. They could parody ideas and suggest self-interest, stupidity or greed as their real motives. They were also adept at replacing real persons with stereotyped versions and, by so doing, suggest they should be ignored or laughed at, regardless of circumstances. 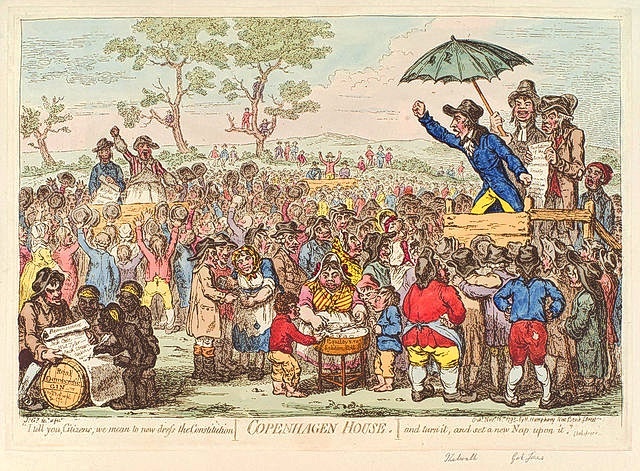 The mere fact that we today still see so much of 18th century life through the prints of Hogarth, Gilroy, Rowlandson and Cruikshank testifies to their power. The radicals and reformers had managed to hold their own in the face of fierce government repression until the rise of Napoleon allowed the government to make this significant propaganda shift. Even amongst the ruling elite, Whigs like Charles James Fox stayed opposed to the ruinous cost of the war, constantly pointing out the ineffectiveness of British war efforts in every area, save at sea, and calling for Parliament to restrain the king and his Tory ministers. The Whigs wanted to seize French trade and possessions; they did not particularly want to return France to its royal family and re-establish the status quo, as the Tories did. The pinnacle of Whig influence probably came with the abortive Peace of Amiens in 1801. Its terms favoured France. The war against the French people had proved unpopular and costly. The British people were tired and discouraged and there was a good deal of sympathy for the changes made in France, even though the violent methods used were deplored. Then the British upper classes rushed across the Channel, hoping to restart their interrupted habit of touring the Continent in search of culture and works of art. What they found was a broadly prosperous country, mostly recovered from the excesses of the Terror. What was there to fight about? Napoleon changed all that. First he used the peace to regroup and strengthen his forces. Then he picked a quarrel about its terms and assembled a huge army of invasion on the Channel coast. He moved the war away from a battle of ideas to a simple struggle for survival against a greedy foreign despot. Suddenly, patriotism was everywhere and opposition to the war was over. To be radical was now firmly equated with being unpatriotic; a fifth-column of French and Irish Republican sympathisers plotting to ruin the country. Conservatives labelled their opponent ‘Jacobins’ after the Club des Jacobins in Paris which was the base for the radical republican and anti-aristocratic factions in French Revolutionary politics. Until the war was over and Napoleon defeated, there was no chance for ideas of political or social reform to be discussed rationally. Amongst the mass of the population, what support there was for reform faded into the background. The radicals were even more violently persecuted. Most lay low and waited for better times. We should not forget that during this period there was no real policy gap between the political parties on issues other than parliamentary power and royal prerogatives. Both the Whig and Tory parties were composed of grandees: the nobility, landed gentry and wealthiest merchants and manufacturers. Both were firmly opposed to widening the franchise beyond the propertied classes. Both despised idea of democracy. The only significant difference was that the Tories wanted an aristocratic government, backed up by a powerful monarchy, while the Whigs wanted an oligarchical one, backed up by Parliament. The Whigs were out of power for an extended period late in the century, mostly due to George III’s antipathy for Charles James Fox and divisions within the party over attitudes to the American and French Revolutions. Having once grasped power, the Tories proved extremely effective at hanging onto it, using all the propaganda I have mentioned to denigrate their opponents as well as the excuse of war to enact laws to silence their critics. When we consider the use of propaganda in the 20th and 21st centuries to sway opinion in support of some extremely unpleasant ideologies, justify genocide and demonise opposing ideas, it’s humbling to remember that it had its beginnings in an age most of us think of as that of gracious buildings, genteel behaviour, Jane Austen’s heroines and the tempting rakes beloved of romantic novelists. This entry was posted in Georgian Society, Politics. Bookmark the permalink. I’m glad I found this blog recently! This was a fabulous post. Even though I’ve researched radicalism in late Georgian England for my Regency England series, this analysis really pulls all the threads together. Thanks.